Cary is the seventh-largest municipality in North Carolina. It is located in Wake and Chatham counties in the piedmont region of the United States. Cary is the closest town to Research Triangle Park (RTP), bordered on the east by Raleigh, Apex and Holly Springs to the west, and RTP and Morrisville to the north and west. The town is also in close proximity to three major universities: North Carolina State University, University of North Carolina at Chapel Hill, and Duke University. 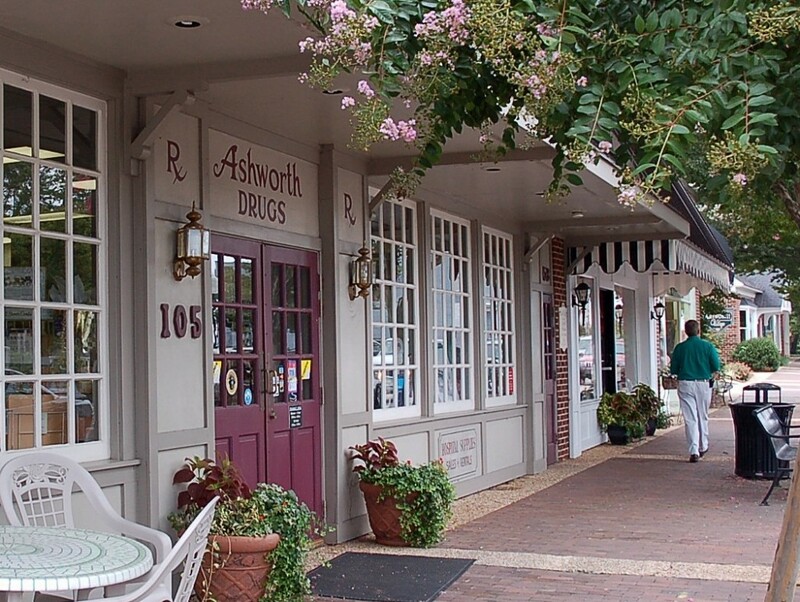 Shown in the photo is Ashworth’s Drugs, a long-standing landmark in the Heart of Downtown Cary. Today’s Cary began in 1750 as a small settlement called Bradford’s Ordinary. One hundred years later, the construction of the NC Railroad between New Bern and Hillsborough went through the town. Traces of this event are still present due to the Cary Amtrak station’s location in the heart of historic Downtown Cary. The credit of founding the town falls to Allison Francis “Frank” Page. He and his wife purchased 300 acres surrounding the railroad in 1854 and named the area Cary (after Samuel Fenton Cary, a congressman that Page admired). Page served as a railroad agent, town developer, and postmaster in the developing town. He built the first streets, a sawmill, and a general store. The hotel Page built in 1868 for railroad passengers still stands today. The town was incorporated on April 6, 1871, with Page becoming the first mayor. Until 1971, Cary used zoning and ordinances on an ad-hoc basis to control growth. With the development of Research Triangle Park, the town adopted Planned Unit Development to be able to draw up entire communities before construction. The first community under this system is Kildaire Farms, located on the former location of the Pine State Dairy Farm run by Thomas F. Adams, Jr. A section of the community is named “Farmington Woods” in its honor.